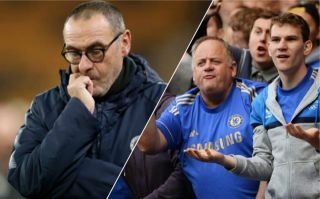 Chelsea fans flocked to Twitter this afternoon to hammer Maurizio Sarri’s decision to start both Willian and Marcos Alonso against Man City. The Blues take on Pep Guardiola’s side at Stamford Bridge on Saturday, as they look to put an end to their opponents unbeaten start to the Premier League season. The west London side are to line-up up without a recognised striker in their side for their clash against City, as both Olivier Giroud and Alvaro Morata weren’t selected to start by Sarri for the match. This wasn’t the only thing that angered Blues supporters though, as Sarri’s choice to start both Willian and Alonso was the decision that seemed to cause the most controversy. Both players haven’t exactly been at their best so far this term, and it’s somewhat surprising to see both of them chosen by Sarri to start against the reigning Premier League champions this afternoon. Following the announcement of their side’s starting XI, Chelsea fans rushed to Twitter to complain about the fact both Willian and Alonso were to start against City. Alonso and Willian. Just forfeit. Why is Willian n Alonso starting ?